A friend in college once had an antiquated fridge. When it filled with ice, he buried a plastic spaceman in his freezer. Eventually the spaceman was entombed. I've been avoiding defrosting our freezer for the past 6 years. Of course, the more ice that accumulated the more I dreaded the task. Recently the process drastically accelerated. In just a few months, the formerly stable crust on the freezer ceiling top grew from an inch or so to a four inch thick massive overhanging shelf. I psyched up and went for it. Here's what I did. I totally did it the right way. It was awesome and fun. Opened both doors. Very important. If I hadn't, all sorts of nasty stuff would have grown in the fridge and stayed forever. Got out all of our pans, Pyrex cake pans, cookie sheets and cheap hand towels. I put the pans and towels everywhere that I expected drips. Boiled a lot of water. I poured it judiciously over the ice. Using a little plastic spatula that came with our George Foreman Grill, I scraped gingerly at the ice. The spatula was relatively flimsy and NOT pointed. At all. This is the most important rule in freezer defrosting safety: do not jam an implement into the walls of freezer. I did not want to buy our building management company a new fridge. Bailed water from the bottom periodically. As things thawed, I could pull off whole chunks of ice. When the bottom was finally clear, I boiled a big pot and put it inside the freezer on a bunch of towels. I closed the door. After a few minutes, I opened the door. The ice on the back wall looked a little weak, so I pulled on it with both hands. It shifted a bit. Suddenly it detached and the giant ice shelf above came down onto my forearms. 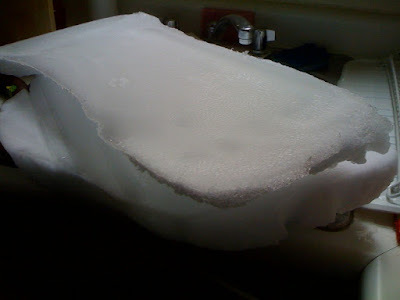 I wrestled myself free and struggled what felt like 20 pounds of ice over to the sink. I had won. The freezer was defrosted. And it only took a few hours. 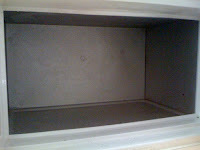 Now we have an awesomely clean freezer.